Variation under domestication « Nothing in Biology Makes Sense! 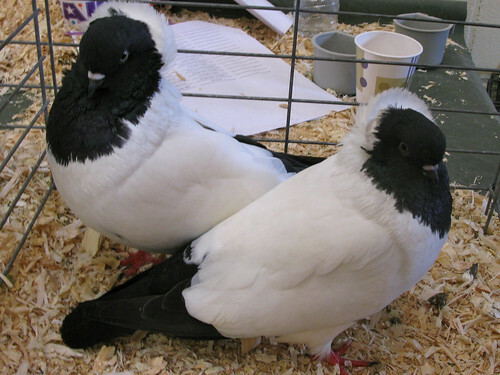 Domestic pigeons of the variety called "nuns." When we reflect on the vast diversity of the plants and animals which have been cultivated, and which have varied during all ages under the most different climates and treatment, I think we are driven to conclude that this greater variability is simply due to our domestic productions having been raised under conditions of life not so uniform as, and somewhat different from, those to which the parent-species have been exposed under nature. There is, also, I think, some probability in the view propounded by Andrew Knight, that this variability may be partly connected with excess of food. It seems pretty clear that organic beings must be ex- posed during several generations to the new conditions of life to cause any appreciable amount of variation; and that when the organisation has once begun to vary, it generally continues to vary for many generations. This entry was posted in Darwin, housekeeping, test run.